The Sims 4 is finally arriving on September 2nd, EA just announced during its E3 2014 press conference. 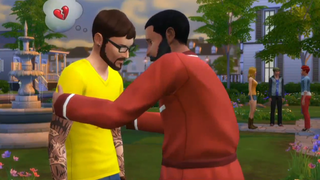 It looks like it's going to be an emotional experience—one so intense that your sims could literally die of laughter. Get excited, Sims fanatics. If you thought the character creation menu was bad, just wait until you start tinkering with the laughter level of a sim like EA did in the demo.